Ahead of the implementation of the Goods & Service Tax (GST) reform, the Uttar Pradesh Government is making all efforts to solve the problems faced by the trading circles for which it held a meeting with the traders on Wednesday. 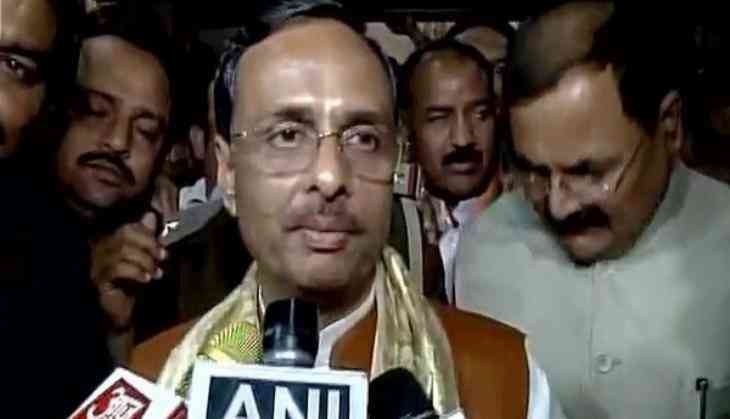 Uttar Pradesh Deputy Chief Minister Dinesh Sharma said that the main focus of the meeting was to solve the problems faced by the trading community. "GST is a revolutionary step in improving measures in trade since demonetization. Business and businessmen are the main centers of India's economic axis. The main point of today's meeting was to lessen the complexities of GST & do away with the problems faced by the traders," he said. The Deputy Chief Minister further told the reporters here that the state government intends to prosper trade and solve the problems of businessmen which are its top priority as the traders are gearing up for the implementation of GST. "After the implementation of GST the pace of financial reform will grow increasingly. The financial rate will also grow by 2% in few years. After GST the rate in UP that is going on with 5-6% will increase to 7-8%", he said. "We will put in front many problems of the traders in our meeting. Our Chief Secretary & Additional commissioner will answer the questions of the traders on the finance ministry's portal", he added. On May 2, the Uttar Pradesh Cabinet had approved a draft bill for implementation of the GST in the state. Prem the action hero? Are Salman Khan and Sooraj Barjatya working on action film?